Furniture is everywhere, although people see them, and use them, all the time, hardly anyone notices the legs they stand on. 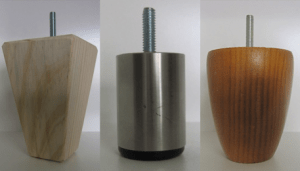 Unless a furniture leg stands out as aesthetically pleasing to look at, like in the case of a quality metal furniture leg, or a wood furniture leg that has special characteristics like its shape design, width and length. For example, a long, slender cone shape wood furniture leg wreaks of class and sophistication, while a pyramid-shaped metal leg gives a more exacting, business look and feel to a piece of furniture, such as padded chairs and leather couches, which are ideal for executive office spaces. Depending on the type of flooring you have in your home or office space, choosing the type of furniture legs is important, so as to not damage your flooring material. Fortunately, even if you have metal furniture legs, a metal furniture leg can easily be equipped with a wooden or plastic coaster to protect your tile, wood or vinyl flooring. It’s true, different flooring types look better when office chairs and couches have quality furniture legs such as metal or wooden furniture legs. For example, a metal furniture leg looks smart against office carpet flooring, while a wood furniture leg goes well with marble and tiles. Taking the shape and type of material of the furniture leg into consideration, and then weighing these against the aesthetic theme of a room, is how best to determine which type of furniture legs to choose. There is a plethora of furniture legs to choose from, thankfully, you can browse through a fine selection of furniture legs of all shapes, sizes and materials at Pete Ross Enterprises – the number one company that specializes in furniture legs. Not only will you find just the right furniture legs you are looking for at Peter Ross Enterprises, to replace old furniture legs on your chairs or couch, or just to add new furniture legs to match your new flooring, but you will also discover many other quality furniture accessories as well. Custom wood couch frames, dining chair frames, bar stool frames and daybed frames that are ready for upholstery, as well as quality custom tables and leather chairs. If you are concerned about quality, you can rest assured to find only the best furniture and furniture legs here at Peter Ross Enterprises. © Copyright 2017. All rights reserved by | » Metal or Wood? Choosing the Right Furniture Leg Peter Ross Enterprises Melbourne | Website Designed by: Netwizard Design.